John George Jepson was born about 1896 at Codnor Park, Ironville, son of George Jepson a coal hewer and his wife Elizabeth Jepson. On the 1901 Census the family was living at Pye Hill and John, the only child listed, was four years old. 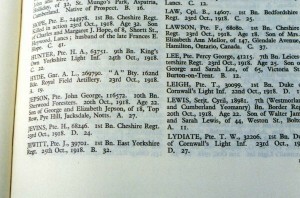 On the 1911 Census, the Jepson family was still living at Pye Hill and, by this time, John George was aged fifteen and employed as a bank lad at the colliery. The 1911 Census records that by by that time, John’s parents had eight children, seven had died and John appeared to be the only surviving child. We have been contacted by John’s family who have advised that John also had a younger sister named Dinah. Private Jepson enlisted at Eastwood, Notts, attesting at Derby on 12th December 1915 aged 19 years and 4 months. 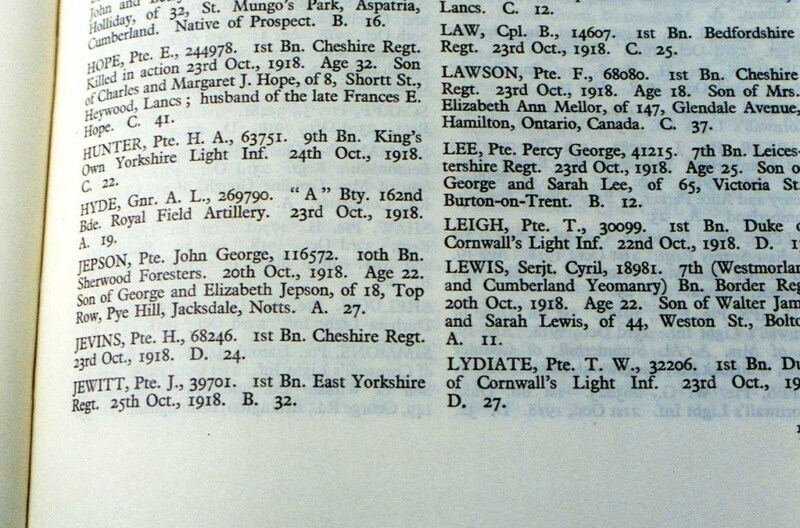 Being in a reserved occupation, he was transferred to the reserve and was not called up for service until 25th April 1918. He was medically examined on 13th April 1918 and the records note that he was of fresh complexion with brown hair and blue eyes. After a brief period of training, in August 1918 he was posted to France. He served in France for only for only 68 days before his untimely death on the Sunday 20th October 1918, aged 22 years, just three weeks before the Armistice. The Sherwood Forester’s Roll states he was killed when attacking the German Lines, near the River Selle, France. So his parents George and Elizabeth lost their only surviving son in the great conflict. On 9th January 1922 the British War and Victory Medals were posted to his father at 18 Top Row, Pye Hill. John George Jepson is listed on the plaque inside St Mary’s Church, Westwood and also on the Jacksdale War Memorial as ‘C J Jepson’ but as ‘G J Jepson’ on the original Unveiling Ceremony’s ‘Roll of Honour’. 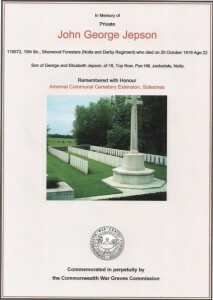 He is buried at Amerval Communal Cemetery Extension, Solesmes, France, Grave ref A. 27. It was on the 20th October 1918 that the 51st Brigade (17th Division) captured Amerval. There are 150, 1914-18 war casualties commemorated on this site. Private 116093 Arthur Keeling of Selston also of the 10th Bn Sherwood Foresters was killed on the same day, during the same attack, Private Keeling is buried alongside Private Jepson in grave A. 28. The 1915 Electoral Roll also records a William Jepson of Sedgwick Street and we would be interested to learn if they were related in any way. Well where exactly should I begin, maybe the proper thing would be to do the introductions. My name is Lisa Cripps (nee Shilton), I am the great-niece of Private John George Jepson from Top Row, Pye Hill, which in itself is neither of much interest or a headliner in the “Sun” or “Mirror” but, this is in fact the complete opposite. 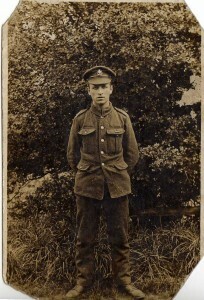 To be exact, back in mid July my brother James emailed a link to me for John George Jepson, at Jacksdale for the fallen soldiers of WW1. There were no photos of John, just a brief description of his life, which was quite sad as were all of the other fallen heroes from the Great War. The website said that John was thought to have been an only surviving child to George and Elizabeth Jepson and that all the others had died as infants. But, that was far from the truth, we were the living proof of that. It was a few days before I dared to pluck up the courage to email the “contact us” to introduce myself as John George’s great niece, would the recipient think I was “off my trolley”? Would I even get a response???? Well if I didn’t press the send button how would I ever find out?????? So that’s what I did, I pressed that button – off the email went into cyber space???????? Well what happened next is nothing short of amazing! From the original tentative email – well, emails were flying backwards and forwards together with numerous attachments from Jacksdale to Mansfield, and back again – awesome, amazing artifacts for the Jepson clan. A meeting was arranged at the NetCafe for the last Wednesday in July I/we (my Mum Joan – daughter of Dinah – sister of John George Jepson – you lost yet?) met some wonderfully kind, amazingly knowledgeable people, and, we found out all about our ancestry at the NetCafe in Jacksdale, from Carol and Martyn. Before that we took a road trip to Jacksdale, all very glamorous just like on the telly – you know that BBC programme “Who do you think you are?”. We visited the wonderful war memorial, and then we went to see if we could find the house John George grew up in, at Top Row and where Dinah was born. Yes we found it tucked away, off the beaten track – well that was nice for my Mum to find the house, quite a moving moment. It might not be Italy, or India or even Australia – but it was all the same just as exciting. We went all the way back to Annesley Woodhouse from our road trip happy and fulfilled in our discoveries. More emails passed back and forth – then it was Wednesday, the day of the meeting – butterflies were doing loop-the-loops around my stomach – what would we find? Who were these people? Off we set photos, birth certificates and lined paper in hand. We arrived at the NetCafe, quite nervous at what and who we might meet and find, but probably more nervous at not finding out any further information about the Jepson Family we were part of. Carol and Martyn were amazing: kind, helpful, warm and more importantly genuinely interested. I think we probably had Martyn’s undivided attention for an hour and a half – in which time there was so much information to take in, we delved into our past, back further and further, back to ________. We discovered more brothers and sisters of John George and Dinah, truly a wonderful experience. It was a like Cinderella leaving the ball at 12 o’clock, we had to leave, not because we wanted to, I think we could have stayed all night, but I had to go and collect my children. But, wait there are so many unanswered questions, so much more to discover. Well there is always next month at the NetCafe, Jacksdale. That, if you’ve followed so far, is not the end. In 1996, some 13 years after my Mamma Dinah had died, my Husband and I visited France in the hope we would find John George’s grave, no one had ever visited him in his final resting place, indeed it was I that had written to the War Graves Commission whilst at school. We knew where he was buried and off we set. Over the channel to France, my husband drove, and drove and then drove some more, through the towns, countryside and tiny villages. Surely not much further? Well it did seem to take a fair old while, but we made it to Le Cateau the town, if you could call it that? I began to worry slightly as to what we might find, it was not the best kept village I had ever seen! We followed the directions, sorry no sat-navs back in 1996 only rustling papers and couples arguing. We drove down this track, I held my breath. It seemed like time had stopped. No, this couldn’t be it. No it wasn’t it was the French cemetery. Past that we went and there before our very eyes, the most beautiful, well kept, clean, wonderful cemetery “extension”. My legs were like jelly, I remember it well, all these years, no one had visited John George, 82 years approximately, he had been estranged from his family, his sister Dinah never knew where he was buried, something she had told my mum she wished she had known. We took photos, signed the book, I cried, we looked around at the other graves, I cried, we went back into the town to find a Florist. We bought roses, my husband took a shine to a French cat, it looked bedraggled, he stopped fussing it when I said it may have rabies. We went back to the little cemetery, two visits for John George in one day, if he’d been alive he may well have said we were “like a bus – wait ages for one, then two come together”. 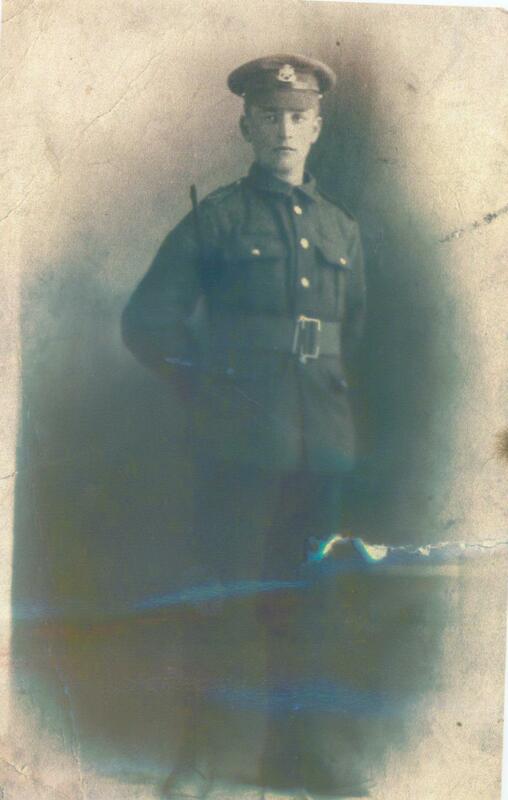 We left the hero of the Great War, our family hero, roses, then we headed back to Blighty. I emailed some of those photos to Carol of our visit and also photos of John George which my mum had been given by Dinah, and the puzzle was solved and the amazing computer whiz Carol worked her magic to transform John George’s profile on the Jacksdale website to include his new family and photos of him in his uniform and our trip to find him. That was truly an overwhelming moment to see the “man with no face or family” transformed into a real life person, a fallen hero from World War 1. Sherwood Foresters World War One Casualties – 11,409. Photographs Courtesy Lisa – grand daughter of Dinah (nee Jepson).